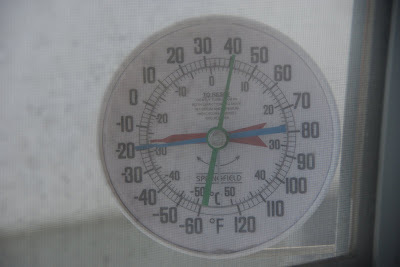 This was the thermometer outside our window this morning. I don't think of -20 as exceptionally cold any more. Sure, it's cold, but "really cold" starts at -30. I wonder if "really cold" only happens to other people? According to the Internet, the low in our neighborhood was -22. The blue bar could be stuck, or perhaps it was slightly warmer at our house. In other news, the photo I posted a few days ago (at right) was selected out of 20 or so entries as the winner of "Weekly Challenge #84" over at pentaxforums.com. the blue bar isn't very reliable.